Brooks Williams, called one of America’s musical treasures, is ranked in the Top 100 Acoustic Guitarists. 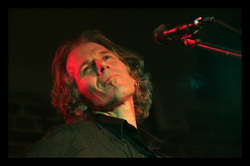 In February 2014 he was nominated best male vocalist by the UK’s folk roots mavens, Spiral Earth. In the time-honoured road-warrior tradition, Williams has honed his songs on stages from Dallas to London, Istanbul to Anchorage, Toronto to Dublin, Detroit to Glasgow, Nairobi to Belfast, New York to Sardinia. Recent appearances include Celtic Connections, Glastonbury, Shrewsbury Folk Festival, Cambridge Folk Festival, Birmingham Jazz and Blues Festival, Ards Guitar Festival, Kerrville Festival and Moab Folk Festival. All in all, thousands of gigs over thousands of miles. Williams is one of the most commanding performers in music today. His soulful singing and hook-laden songs—to say nothing of his guitar playing—are turning heads. In 2012 he was awarded the Cambridge Arts Award, appeared on Radio Ballads, a six-week BBC Radio broadcast celebrating the London 2012 Olympics, and guested on The Andrew Marr Show on BBC TV.